The "z" valve easy-turn knob allows for easy patient use without additional leverage from wrenches or toggles, saving the expense of replacement parts (wrenches/ toggles) and the time required to assist patients with the basic operation of opening and closing an oxygen valve. The "z" valve incorporates o-ring seal design technology that requires less torque than standard US and foreign manufactured valves. Each valve is 100% leak tested to full service pressure. 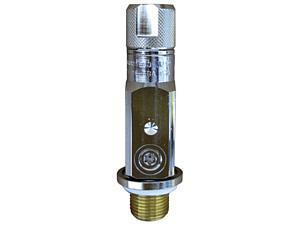 The knurled hand knob also includes pneumatic wrench flats for high volume filling.